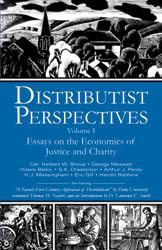 Copies of Distributist Perspectives normally ship within three business days. Copies of Miscellany normally ship within three business days. A Miscellany of Men is a collection of essays on sundry topics written by one of the English language's greatest essayists, G. K. Chesterton. In the Miscellany, Chesterton covers all kinds of timely truths and and makes prescient and enlightening observations. Covering topics ranging from literature to philosophy, history to social criticism, it is a snapshot of thought on 20th-century Europe (and the world) by one of Europe's sharpest wits and ablest pens. With chapter titles ranging from "The Miser and His Friends" to "The Red Reactionary," from "The Separatist and Sacred Things" to "The New Theologian" and "The Romantic in the Rain," this compact volume includes 39 brief sketches of individuals, each one of whom illustrates an aspect of contemporary society. Social, historical, and religious thought all figure prominently in this book, which deals with a myriad of topics from the sane and healthy perspective of Chesterton's integral, unapologetic Catholic Faith. 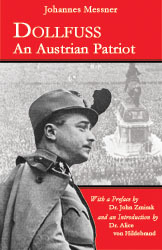 The book remains particularly unique for its willingness to criticize some of the uncomfortable truths about capitalism while simultaneously condemning inhuman, bureaucratic socialism. IHS Press is pleased to present an Introduction to this new edition by Dale Ahlquist. Dale Ahlquist is the President of the American Chesterton Society, author of G.K. Chesterton: The Apostle of Common Sense, host of the EWTN television series of the same name, publisher of Gilbert Magazine, editor of The Annotated Lepanto, and member of the Advisory Board of the Chesterton Institute at Seton Hall University, New Jersey. Copies of Ethics normally ship within three business days. 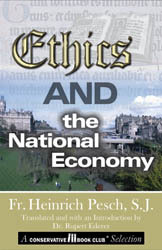 Ethics and the National Economy was written by Jesuit Fr. Heinrich Pesch in 1917 as part of a symposium of Catholic thinkers on the problem of Christian Natural and International Law. His contribution stresses a truth which is as fundamental as it is today neglected: that morality must govern economic life. Taking apart the various aspects of economic activity, Fr. Pesch throws the light of the Moral Law on such topics as the manufacture of material goods, exchange of goods, remuneration and wages, justice in pricing, andof coursehe looks at what he calls the two "absurd consequences" of the individualist, free-market school of thought: Capitalism and Socialism. Heinrich Pesch, S.J. (18541926) is one of the greatest of philosopher-economists, whose Solidarism is based upon the classical and Christian understanding of man and socio-economic life, rooted in the teaching of Aristotle and perfected by St. Thomas Aquinas. His other works include Liberalism, Socialism, and the Christian Social Order (1900) and the monumental Compendium of the National Economy, which ran to nearly four thousand pages and earned him recognition as the first Catholic to write a complete, scientific economic treatise. Volume I of his Compendium saw numerous editions and was a standard text in the social science curricula at many Catholic institutions of higher learning. Dr. Ederer was educated at St. Louis University, where he was associated with Pesch scholars Dr. Franz Mueller and Fr. Bernard Dempsey. He taught economics for over 40 years, retiring as Professor of Economics from SUNY College, Buffalo, N.Y.. He has written or translated 15 books and nearly 200 articles on economic topics. He is the recognized living authority on Heinrich Pesch. Copies of The Gauntlet normally ship within three business days. 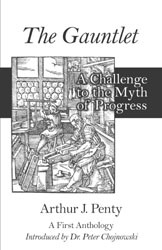 The Gauntlet, subtitled "A Challenge to the Myth of Progress," includes selections from Old Worlds for New (1917), Post-Industrialism (1922), Towards a Christian Sociology (1923), and Means and Ends (1932). This first-ever anthology of Pentys works presents a compelling vision both of whats wrong with the world and of what kind of socio-economic order would help to make it right. The writings in this volume provide a sampling of Pentys thorough and persuasive critique of the myths that dominate modern economic and social thought. They also outline his intellectual and practical program for the restoration of such essentials in economic life as the dignity of labor, justice in pricing, equity in property distribution, quality in craftsmanship, preservation of rural culture, and, above all, the recognition of spiritual Truth as the foundation of all real economic order. Copies of Economic Effects normally ship within three business days. 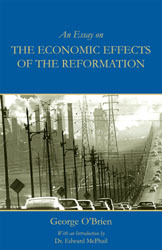 Essay on the Economic Effects of the Reformation is a masterful work of economic history by one of the 20th century's premier economic historians. Dr. O'Brien was for many years professor of Economics at University College Dublin, and he held for a time the Economics Chair. His Magnum Opus, The Economic History of Ireland, won him recognition as one of the greatest scholars ever of Irish economic history. In this work, Dr. O'Brien brings his knowledge of economic thought and history to bear on the difficult problem of the origins of Capitalism and Socialsim, examining both of them in light of the historical epispode known as the Reformation. His judgment may be shocking, but it is quite Catholic: the growth and development of both Socialism and Capitalism would not have been possible to the extent that it was without the ecplise of the Catholic way of life that followed in the wake of the Reformation. 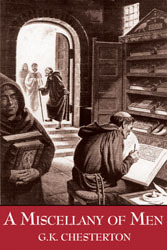 With such a surprising but nevertheless well-argued and persuasive thesis, this book is sure to challenge Catholics and all men of good will to abandon preconceptions taught by the Establishment and come to grips with the facts of economic history. Originally published: London, 1923. IHS Press is pleased to present a new Introduciton to this edition by Dr. Edward McPhail. Edward A. McPhail is Assistant Professor of Economics at Dickinson College in Carlisle, PA. He is a student not only of modern economic thought but also of such Catholic thinkers as Belloc, Chesterton, and O'Brien. His interestes and research specialties include eugenics and the relationship between economics, ethics, and religion. He is a frequent contributor to numerous journals and societies, including the American Chesterton Society. Richelieu is a classic yet fresh treatment of one of the most central figures in the making of modern Europe, and Belloc tells his story as only Belloc can. Not a sterile, overly footnoted academic dissection of secondary sources, Belloc's Richelieu is a lively, engaging, truth-is-stranger-than-fiction tale of an intriguing and ultimately tragic personality. 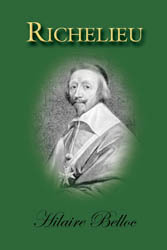 The book directly tackles the central problem of the Cardinal, painting a surprisingly sympathetic portrait of the man while offering an objective critique of his policies: policies that did so much to make permanent the rift that split Christendom and which, thanks to Cardinal Richelieu's efforts among other things, was never to be repaired. Fr. Crowdy is a Roman Catholic priest stationed in Bristol, England, who was rised as an Anglican and trained as a lawyer. Following World War II service in the British Army in India, he converted to Catholicism and was ordained a priest at the Oratory of St. Philip Neri in 1954. He has served as a priest in Florence, Italy, and in Northampton and London, England. His career and his personal scholarly interests make him an uncannily qualified student of Belloc's writing.